William Samuel Spriggs was born on November 18, 1925 in Ogdensburg, New York as the second child to Joseph J. (1898-1968) and Gertrude (Countryman) Spriggs (1898-1963) who was Canadian born. They brought up four children, Alice (1924-2014), the eldest, William 'Bill' (°1925) and two younger brothers Arthur J. (°1927) and Lawrence G. Spriggs (°1928). Arthur (#42199820) served in the Army during WW2 and was in Military Police and Lawrence Spriggs was in the US Navy from 1945 till 1946. "Many children went over to the train tracks, and when the conductor said "I'm going for coffee", he was gone for an hour. Then all the kids would take coal from the trains and put it on their sleds to take it home for heat. We also went fishing and the Fish and Wildlife guy would say – ’I’m going for lunch, I’ll be back in an hour, be sure you are not here fishing when I get back or I’ll have to arrest you’. – We caught whatever fish we could and then sold them. My mother would crochet doilies and stiffen them with some kind of sugar mixture and those we sold too”. So, all the children had to support their family. But also the government supported us, they gave us flour and lard (bacon fat) and also corduroy clothing”. … "Times were tough during the depression". The Civilian Conservation Corps (CCC) was a public work relief program that operated from 1933 to 1942 in the United States for unemployed, unmarried men from relief families as part of the New Deal. The CCC was designed to provide jobs for young men, and to relieve families who had difficulty finding jobs during the Great Depression in the United States. 3 million young men participated in the CCC, which provided them with shelter, clothing, and food, together with a small wage of $30 a month ($25 of which had to be sent home to their families). We are "better together" preserving the heritage of the CCC. "I learned how to be a soldier. I learned infantry tactics, how to use weapons, how to fire and so many more. 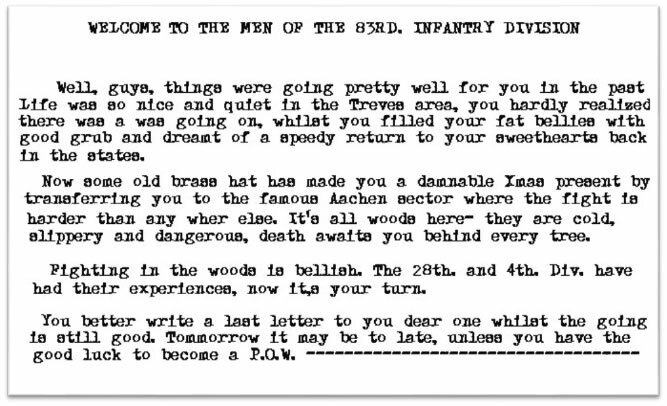 When training at Fort Meade in Maryland, I met a recruit from Irasburg, who had enlisted on November 16, 1943, during the height of World War II. His name was Raymond Sanville, a husband and father of two children when he entered the U.S. Army. We shared many good times leading up to our arrival in the war zone. He wasn’t just my best friend, he was probably my only friend at the time." After training for many months Bill received orders to be shipped overseas. On June 16, 1944 he shipped out from Camp Shanks, New York and arrived in England June 27, 1944 where he was placed in a replacement depot waiting until he was needed somewhere on the battlefield. Bill spend a brief time in England based in Chester, there he was offered a chance to stay longer to train to become a glider rider, but he declined! 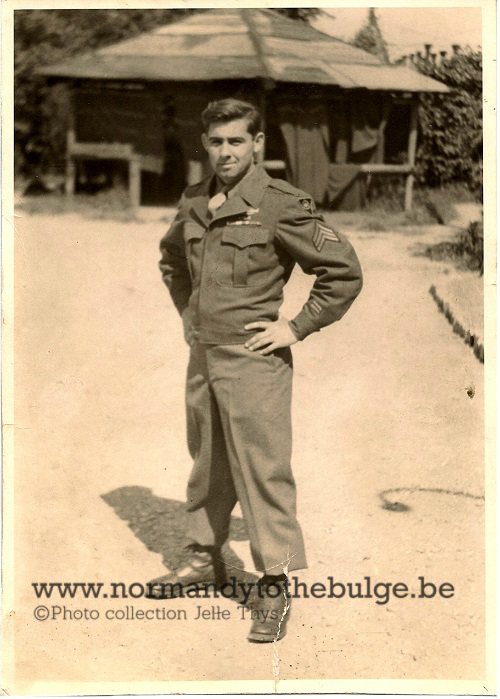 On D+24, June 30, 1944 he landed on Omaha Beach together with hundreds of other reinforcements and was assigned to Company C of the 329th Infantry Regiment, 83rd Infantry Division. 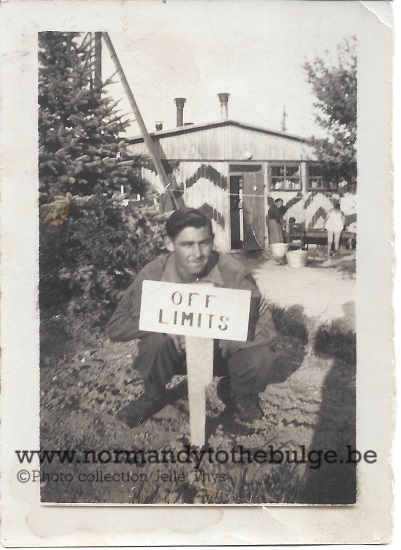 He stayed with this unit until he left Europe on November 22, 1945. He separated from the Army at Fort Dix, New Jersey on December 4, 1945. 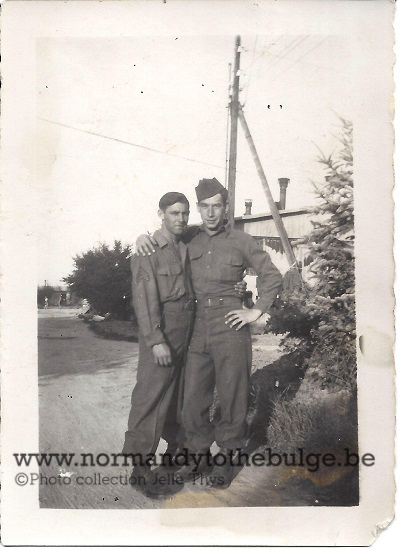 Bill, 18 years at that time, and his friend Ray Sanville crossed the English Channel together. Each soldier wearing 85 pounds of gear on their backs, they hit the beach of Normandy, with hundreds of other replacements, on Omaha Beach. "Because of the storms earlier in the month, we could not land anywhere else. A storm, the worst seen in the Channel in almost twenty years, destroyed the ingenious Mulberry floating docks, so we came in via landing craft jumping over the side when we got closer to the shore. However when I jumped over my heavy gear dragged me down beneath the surface and I couldn't get back up because I was not tall enough. The guy behind me was however and he grabbed my backpack and pulled me up again. I shall never forget the first day we set foot on French soil." 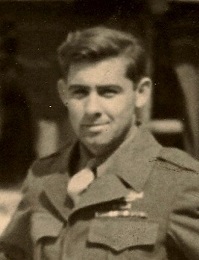 Bill came into the European Theatre of War early July, 1944 and was held at a replacement depot until needed by one of the many combat units in Normandy. Being a replacement he did not know when this would be or what unit he would go to war with. 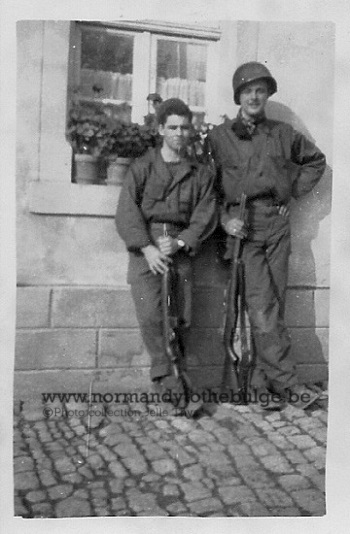 Eventually Bill, together with his good friend Ray Sanville joined Company C, 329th Infantry Regiment. 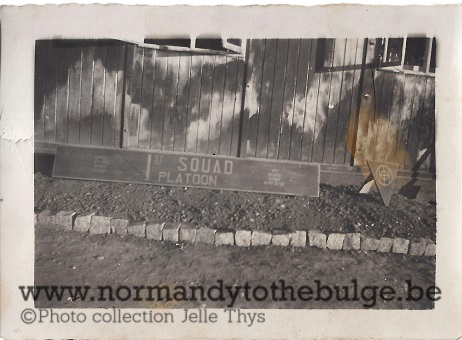 This unit was in the vicinity of Sainteny at the time (July 23, 1944) and had suffered a great number of casualties after it's first few weeks in the hedgerows. "As casualties left, replacements came in but no one in their new unit was looking out for them. I don't know him and don't want to know him, is what the combat veterans thought. Therefore, my initial experience as a replacement was not good, I felt isolated as none of the combat veterans wanted to talk to any of us replacements. 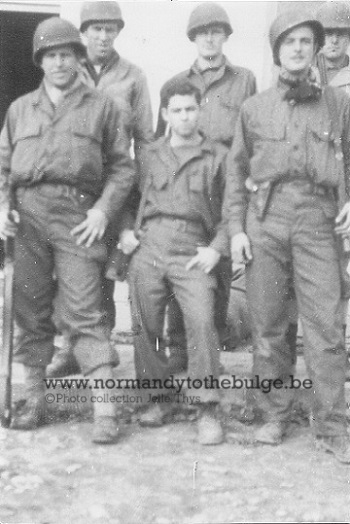 During our time in Normandy (and the rest of Europe) we did a lot of digging! My foxhole buddy to whom I was assigned at that time (S/Sgt. Emitt Beason) was 6 feet 2 inches or so tall, I was about 5 feet 2 inches tall. I often joked that I wish I would have not been partnered with him and a shorter buddy would have been better. When I was digging a foxhole I could have done it in quick time due to my own short height. The fact that I had a taller buddy made me have to do extra work digging a fox-hole to allow for extra space needed that I was never going to use. Emmit was a good friend however and one of the bravest man I ever met. He knew no fear but sadly this got him badly wounded later during the war when he walked out onto a road covered by a German MG. He was shot through the cheeck, badly mutilating his face. I thought he was killed but later learned he survived. His jaw was gone however and he had only two teeth left. Hedgerow fighting was also new for all our troops. With there 88mm guns and mortars , the Jerries broke the morale of the troops at different times. They used timed fire in known bivouac areas and inflected many casualties. Many soldiers were killed in their fox holes. I was also injured in France, I got hit by some shrapnel while in a foxhole and received the Purple Heart. 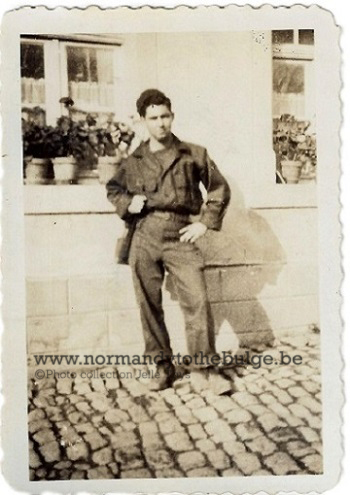 After being send to the rear area to a field hospital, I returned back to my unit after a short time and continued with my Company to Brittany." After Operation Cobra broke the German defences the American Forces, including the 83rd Division, were able to break out of Normandy. The 83rd continued its push towards Brittany and the medieval city of Saint Malo. It was here that Bill experienced one of his most emotional moments of the war. "After a particularly bloody battle with firmly entrenched German forces at the outskirts of Saint Malo on August 7, 1944, I was called to the Company CP. My sergeant ordered me to search the battlefield for dead American soldiers and remove their dog tags. This was to identify the dead, information that would eventually be relayed to their families." When he was given this order Bill figured he’d find two or three bodies. That wasn’t the case. He found 35 of them, many grouped together in a shallow, narrow ditch. 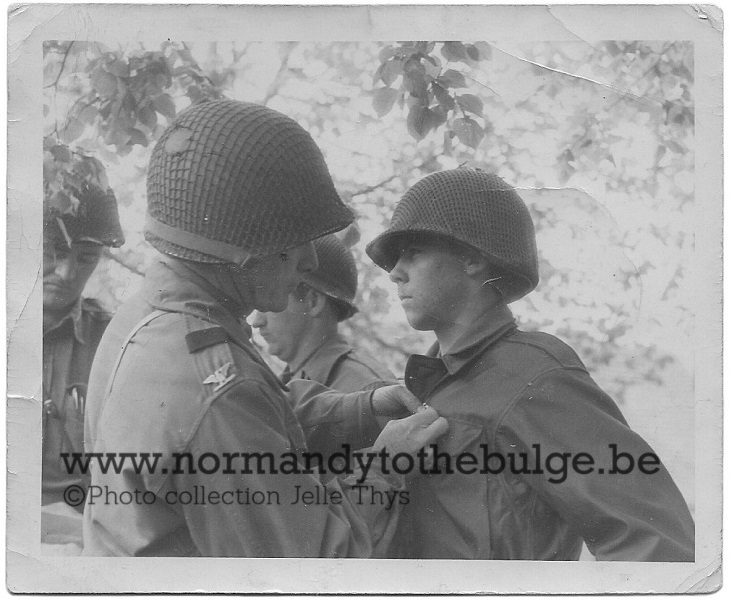 Moving from body to body removing the tags, Bill looked down at one dead soldier and realized it was his friend Raymond "Ray" Sanville. "35 bodies lying dead on the battlefield in Brittany, including my best friend Ray, made a deep depression on me. I was still an unexperienced soldier and this was the first time such an order was given to me. Because of the shock of seeing my friend Ray and my inexperience I made a tragic mistake. Each soldier carried two dog tags with the owner’s identifying information. When a soldier is killed in combat one of the tags is retrieved from the body while the second one stays with the body to help identify it later. I was only 18 years old and took both of the tags. I had no clue I was supposed to leave one. The thought that this mistake might have been the cause of 35 soldiers reported as Missed In Action rather than Killed In Action has haunted me my entire life. Fortunately several years ago I was able to learn of Ray's fate. He was identified on the battlefield and brought back home after the war where he is still buried today. I often still think of him and all those other boys that I found on that day." Following Ray’s death the war went on for Bill. He fought his way further across Europe. After the successful operations in Brittany, the 83rd was ordered south to the vicinity of Nantes and Angers in the Loire Valley on August 20th. While elements moved south to protect the north bank of the Loire River, the main body of the Division concentrated south of Rennes for patrolling and reconnaissance activities. The movement into Luxembourg was completed on 25 September. Taking Remich on the 28th and patrolling defensively along the Moselle. From the 1st through the 5th of October, the 83rd Division advanced in heavy combat towards the Siegfried line across the Sauer as the 329th fought the battle for Grevenmacher. On the 7th, the 329th took the city of Echternach on the Sauer River. After securing the rest of the towns west of the Moselle. The remainder of the months of October and November were dedicated to training of the new replacements and a well-deserved rest for the men. The training intensified the men were now training on fortified and fixed positions. The division used the old Maginot line fortifications to the rear of the Siegfried line. Each regiment took turns rotating off the line for training. The rest and training period at Luxembourg would not last, duty would call for the 83rd's next mission, the Hurtgen Forest. On 5 December, the 83rd Division relinquished its positions along the Moselle Valley to the 22nd Infantry of the 4th Division. The 83rd was to trade places with the 4th Infantry, which was badly in need of a rest and refit. The next day they left by truck and traveled 185 miles north to the Hurtgen Forest, just southwest of Aachen to relieve the 12th Infantry. The Hurtgen Forest is about twenty miles long and ten miles wide. The forest is accented with steep gorges and winding slopes covered with thick layers of evergreens and firs. This heavy foliage made it too easy for a soldier to get lost in the woods, and many did. After a six-hour truck ride through freezing temperatures the division arrived at Gressenich, Germany at 1900 hours. Unknown to the men of the 83rd at the time, eight divisions had lost more than of 22000 casualties in the forest during the previous two months. The Hurtgen Forest was fanatically defended by some of the most experienced troops Germany had, in an effort to push to Americans out of Germany’s doorstep. Two crack divisions of the 47th Volksgrenadiers and the 353rd Infantry Division opposed the G.I’s, even some paratroopers of the 3rd Fallschirmjager Division, were dug in just a few yards of their foxholes. The 83rd’s new mission was to hold the positions they had just taken over. With the 330th on their right, and the 329th on the left, the division settled in. 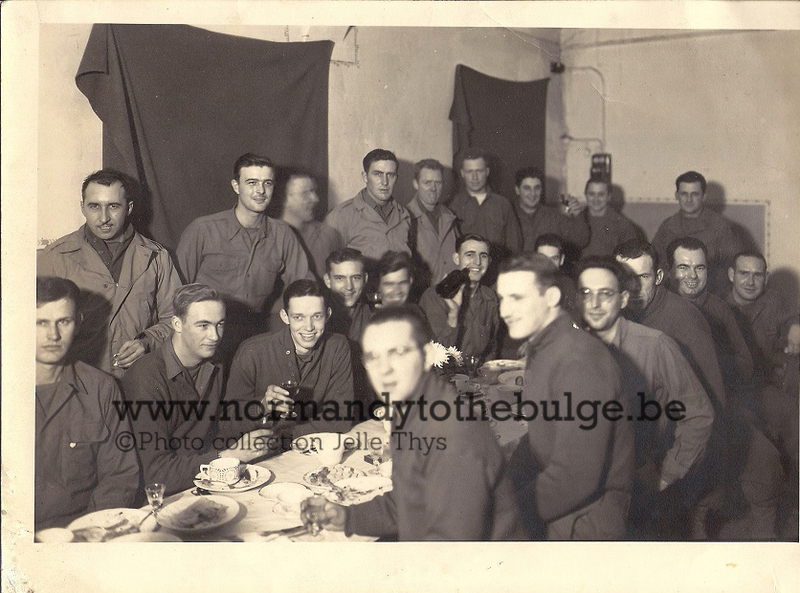 Even though the war was still going on, Company C, along with the rest of the 329th, had a real Christmas Diner. After the heavy fighting in the Hurtgen Forest, the 329th were pulled back to the vicinity of Aachen, Germany. 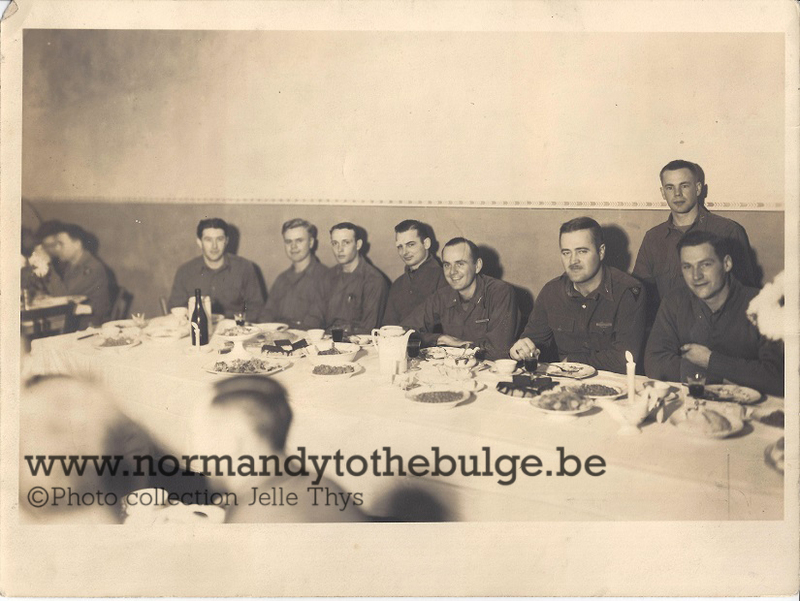 On the night of December 24th they trucked 75 miles to Eilendorf, Germany, where they had Christmas dinner in the rubble on December 25, 1944. William "Bill" Spriggs is marked by an X. 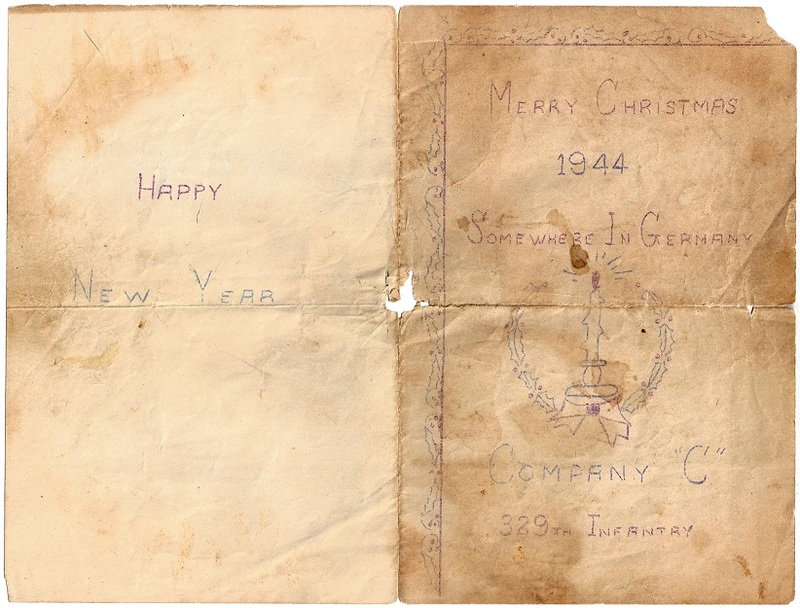 On December 16th the 83rd Infantry Division was still fighting in the Hurtgen sector. Activity consisted of patrols and limited skirmishes in this sector until 22 December when the division was ordered to be relieved by the 104th Infantry division and ordered to the vicinity of Aachen, Germany as part of the Ninth army reserve. Meanwhile the German offensive continued. The 83rd was moved to reinforce the defensive positions along the northern flank of the German bulge penetration. The Division remained in this area until the 29th of December when they received additional orders to move to the vicinity of Ottre, Bihain, and Buissonville to support the 3rd Armored "Spearhead" Division. Once again the division was ordered to fortify defensive positions. The next day the 329th started the attack. With the 2nd Armored Division on it's right flank, and the 331st on it's left, the 83rd launched it's assault to stop von Rundstedts winter offensive. The 329th's mission was to secure the ground south of the L'Homme River. The attack which started late in the afternoon caught the Germans completely by surprise. The Germans not willing to give up Rochefort that easily counterattacked all night and throughout the next day. B Company became isolated and cut off from the regiment. The Germans tried to dislodge the Americans with tanks and infantry, even so much as moving them to point blank range inside the first floor of the occupied houses. After a prolonged fight the Germans gave up and withdrew from the town. The 329th was then relieved by the 100th regiment of the British 53rd Division on 30th of December. My aim is to tell you about the Ardennes Forest battle of December 27, 1944 through January 25, 1945. While we had been engaged in the battle of the Hurtgen Forest from December 8 to December 23, 1944, our mission was to move through the forest and capture the village of Rolsdorf across from the city of Duren on the Roer River. The 329th regiment was summoned again to move and we were brought to Aachen, where we had Christmas dinner in the rubble. We then moved to the area of Dinant and Celles to stem the advance of the German break through, a fact which was unknown to us. The 83rd Infantry Division, 329th Regiment under Lt. Co. Tim Cook, Battalion Commander, First Battalion, B and C Companies, were given the mission to liberate the city of Rochefort, Ardennes, Belgium, most which incidentally was the furthest point of the German counter-attack. We jumped off on December 27th towards Rochefort, we were engaged during a hell of a tank fight, and as we moved close into the village, as I recall it was all downhill and there was a lot of machine gun fire, my squad leader was hit in the lower portion of his face with a .50 caliber bullet. I had to leave him, which was very hard to do. Company B made a flanking attack, followed the river and moved into the village during the night before the Germans were awake there. All I know is that the Germans surrounded Company B and the next three days and nights of heavy and consistent fighting by Company C, and we were unable to relieve them. B Company’s communications became less reliable as their radio power supply waned and eventually their communications with us was lost, and we thought they were captured. After the third night B company walked out as the Germans had fled. We were relieved by the 100th regiment of the British 53rd Division on 30th of December that took over the village defense. We were ordered to set up a defense in the Ardennes Forest as the weather was unfit to continue our offense. Word came down that we were to take a patrol and look for any German tanks in the area. My platoon, which was 1st Platoon, C Company was on listening outpost, about 1000 yards ahead of the rest of the company. The listening post was to alert our main line of defense of the Company and should we encounter the enemy. In ordered to effect this it was necessary to have another platoon relieve us on the listening post. I was ordered to go back to the Company and pick up a platoon to replace us on listening outpost. We moved out, the weather was terrible. We followed the firebreak for about a thousand yards in blinding snow when the 1st. Lieutenant decided to stop and rest, he sure as hell did not want to go any further and he agonized over that. It was about two or three a.m., after about an hour we proceeded to fulfill our mission, and some time later we found a very large tank encampment of approximately thirty tanks. We tried desperately to capture one of the sentinels but with the magnitude of their force we had second thoughts, we did not want to alert them. The 1st. Lieutenant waived that idea and we returned to our listening post. I took a Pfc. with me and guided the replacement platoon to their defensive position. As the two of us were nearing the edge of the forest and coming on to the fire break there was a lot of talking and a very noisy German five or six man patrol, I might add that we could always tell the German patrol by the clinking and clanking of their equipment, they were behind our listening outpost. The Pfc. said those are ours and whispering I told him to be quiet they are not our patrol they are Germans we will let them pass and pick them off. As the last one got by us, we attempted to fire our guns but they were frozen. At that point in time, after sweating them out, we proceeded to go back to our outpost to alert the OP that there was a German patrol behind them. To make things even more difficult my partner was snow blind and it became necessary that I drag him by the coat sleeve. Once we returned to our listening outpost and alerted them about the German patrol behind us, we set up our watch for both directions. Later they returned the way they had gone and were four of the five were killed with the exception of one, and he cried the rest of the night "Horst, Horst wo bist du" (Horst, where are you) the rest of the night, and in the morning he was without a scratch. The platoon sergeant and the 1st. 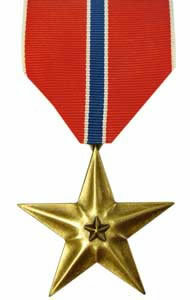 Lieutenant received silver stars for that action. 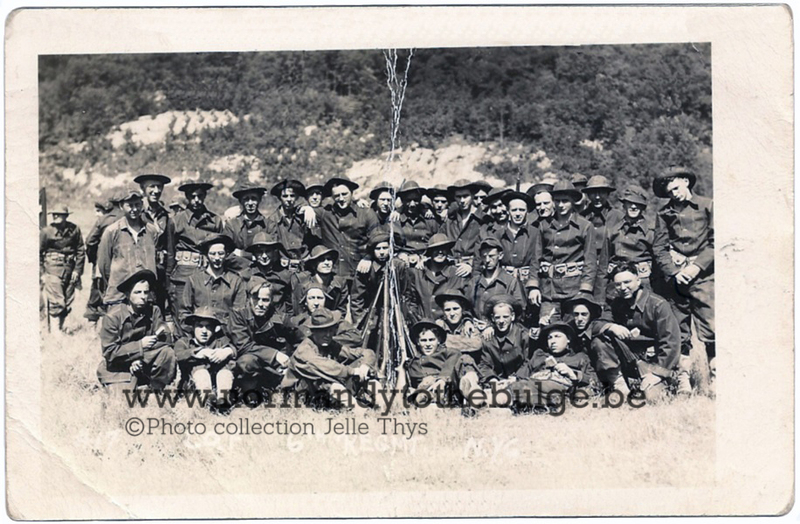 Continuing through the woods our next mission was to cut the St. Vith - Malmedy highway, and in heavy fog we emerged from the forest en route towards Petite Langlier with C Company, 329th IR. north and east of the village, the 3rd Battalion was making a frontal attack in front of Langlier. We were in the Bois de Ronce (Ronce Woods) and overran a German defense where we captured a lot of prisoners and they were being pushed back through the firebreak as one came abreast of me he was carrying something on his head. I stopped him and took what was on his head, he started to cry, it was a large wooden salad bowl full of cut meats, and he was afraid that he would go hungry, problem was I was hungrier. There was plenty of help to polish it off. Our fighting continued through the forest. The 331st IR. was to liberate Petite-Langlier and consequently got housing and were out of the weather. We, along with the 330th IR, fought through the woods towards Courtil, Honyelez and captured Bovigny. Two other units came together there to cut the Malmedy - Saint Vith Highway we were relieved by the 2nd and 3rd Armored Divisions. Thus we accomplished our mission after twenty-five days in the woods. We were relieved and trucked to Hamoir Belgium to warm up and take care of the trench foot, rest and replace the cadre. The story of the 83rd continues. After a refit in Belgium during the month of February, the 83rd prepared for its next assignment: The race to the Rhine River, the last major obstacle to the German heartland. The 83rd went on to fame when they crossed the Roer River and raced to the Rhine River, reaching it in only 17 1/2 hours after being committed. Once the Rhine area was secured it was time for the 83rd to train for a river crossing in preparation for an assault across the Rhine. Once they crossed the Rhine the 83rd raced to meet the Russians at the Elbe river and were only 65 miles of Berlin when they were ordered to stop. Once the 83rd crossed the Elbe River, there they were ordered by General Eisenhower to halt. They remained at the bridgehead until the final surrender of Germany on May 8, 1945. Once Germany surrendered, the 83rd moved to the Bavaria area and began Occupation duties. Soon word was out that the 83rd was selected as one of the divisions for the invasion of Japan, and training of the division began in earnest. The Division then remained in Germany for several months until the US dropped the Atomic Bombs on Japan and they surrendered. The Second World War was over and the GI's were going home. During Occupation Duty in Winzer, Bavaria, Germany. Niederalteich, Bavaria, Germany Niederalteich, Bavaria, Germany. 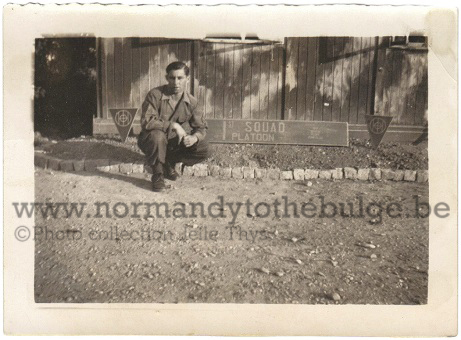 Bill is crouched behind the sign seperating the soldiers from the female barracks. 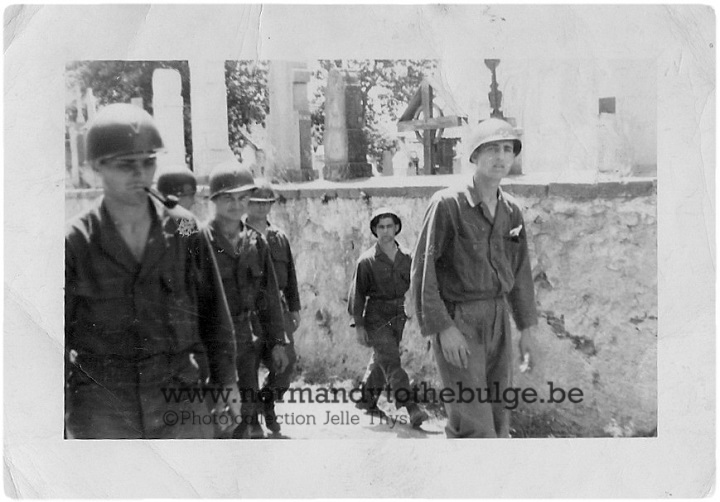 Battalion, 8th Armored Division. He had also amassed 72 points which allowed him to get shipped home. He left Europe on November 22, 1945 and separated at Fort Dix, New Jersey on December 4, 1945. As Bill was a high school drop out, he had to work here and there in some factories until he decided to go back to College. He became an electrician and owned his own television repair bussiness until he went to work for the Army Corps of Engineers when they were building the St. Lawrence Seaway. He obtained a Masters Degree in Business and before he retired, he was Assistant Administrator of the St Lawrence Seaway. Currently he spends most of his time maintaining his house on the St. Lawrence River in Massena, New York. Bill has three children, his oldest daughter Pamela died in 1984 and his youngest daughter Paula and his stephson Jeff also live in Massena. He has seven grandchildren and 5 great-grandchildren. There's another angel in heaven today. My dad passed away last night, December 12, 2016, after a hard-fought battle with heart failure due to heart disease. He was small in stature but a giant to those who knew him. He was my hero, my "Mr. Mom" growing up, and the toughest guy I ever knew. He taught me that the word "can't" is not in the vocabulary, but "love" always is. Even to the end, he blessed us with his funny wisecracks. He taught us to laugh during the tough times, and that has served me well. He could smile with his eyes, and that twinkle was apparent to everyone who knew him. Rande and I are forever grateful for the trips with him to France, Belgium, Luxembourg, and Germany, along with the many lifelong friendships and "adopted family members" we have gained along the way. I am sure my sister Pam was there to greet him along with his family and fellow comrades from the 83rd Infantry of WWII. I will miss him so, but will carry on like a good soldier because life is precious and tough times are part of it, but certainly not all of it. Tomorrow will be a better day.